2. Open "Applications (MacOS 9)"
4. 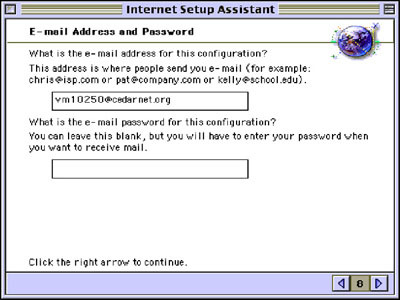 "Would you like to set up your computer to use the Internet?" 5. Do you already have an Internet account? 6. Click the right arrow to continue; there is nothing you need to change in this window. 7. 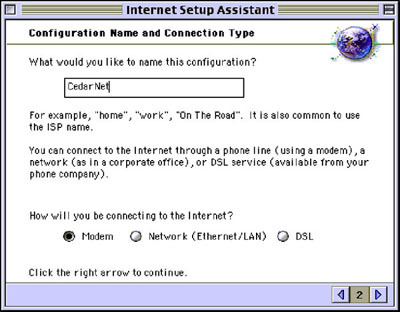 Type "CedarNet" into the box to name the connection, and select "modem"
CLICK the arrow at the bottom right to go on. 8. Verify that the computer is reading the correct modem and port. 9. Select Tone (most phones are Tone). 10. Do not set it to ignore the dial tone. 11. Enter in the dial-in phone number 232-4135. 14. Does your ISP require that you use a script to connect? 15. Select NO. 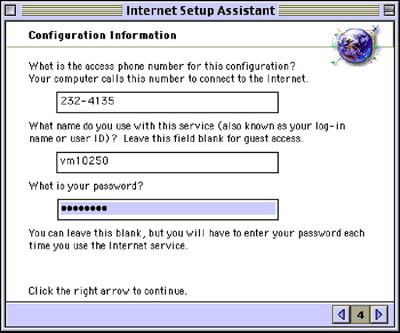 CedarNet's server will assign the IP automatically. 17. If you leave the password blank here, you will have to type it in each time you open email. 19. 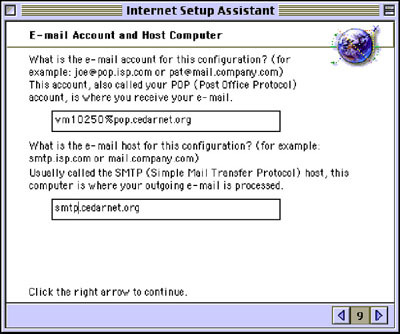 For the SMTP host, type in "smtp.cedarnet.org"
20. If you join newsgroups, put "corp.supernews.com" in this space. Congratulations! You are now connected to CedarNet. If you have previously had another internet provider, you will need to delete all information about that provider from your dialer and your browser (Microsoft Explorer or Netscape Communicator) to insure that your mail operates properly. If you try to send mail and you get a message that the server cannot be located, you probably have your old server still listed someplace on your computer. Go to the "Control Panels" under the Apple menu and check your "TCP/IP to be sure your have cedarnet.org in the Domain Name and NOTHNG in the DNS address.